TomTom Golfer 2 preview: Hole in one, or golf GPS watch that's par for the course? TomTom has released a new version of its golf GPS wearable, appropriately called the Golfer 2, looking to put all the information you could want onto your wrist. It replaces the current Golfer, expanding its functionality and following the same lines as the recent Spark and Runner 2 models. We spent some time checking out the new golf watch at the launch of the device at the Wearable Technology Show in London. Like TomTom's other sports watches, the Golfer 2 uses the same body design. This is an evolution of the previous design, with the body extending into a curve that houses the four-way navigation controller on the top, as well as the charging connectors. The strap is a separate part of the package and it's softer than the recent runner versions. It's more supple and that fits the user case better: the Spark and Runner 2 are designed not to hold onto sweat, whereas the Golfer 2 won't see you sweating quite so hard on the course, so gives you a softer strap designed for comfortable use over a longer period of time. The softer band adds a sense of the premium to the occasion too, with a great folding clasp, more like a conventional watch, and highlights around the bezel of the watch and the controller. It initially comes in black or light grey, the latter the better looking in our opinion. It's a lightweight watch and compact; although it contains GPS, it's not too bulky so you don't feel like you've got a huge lump strapped onto your arm. As the design is close to that of the TomTom Spark, much of this is familiar territory. We like the action of the button and we like the contrast of the display. It doesn't get carried away offering a touchscreen or colour, and that's likely to result in better battery life. Importantly, the information is easy to see on the display. The Golfer 2 is also water resistant, so you can play in any weather. The TomTom Golfer 2 uses a hierarchical user interface that’s easy to navigate using the controller. This is now pretty standard across a range of TomTom's devices – like the Bandit action camera – and we've found it to be pretty simple to use. It will be familiar to users of the existing Golfer, as it's pretty much the same information, presented in the same way. That means all the information is dedicated to golf, rather than being a multi-sport device. Pre-loaded into the Golfer 2 is information on 40,000 courses worldwide, although some of this relates to different combinations on a course. When you fire up the Golfer 2, it will use the GPS to detect where you are and offer you courses nearby. Once you've selected your course, you're presented with the information showing you distances to the front, centre and back of each green. There's an indicator to show you if it's straight or a dog-leg fairway, as well as giving you detailed information on hazards. These are graphically represented and placing your hand over the display gives you a magnified view of the hazards, including the distances to them, to help you decide how to play each hole. Much of this information was available in the previous version, but you now have automatic shot detection too. Automatic shot detection uses the on-board gyroscope and motion sensors to detect your swing. There's a feedback buzz at the end of the fore swing so you know it's registered and cleverly it will only record one shot within a 3m area. That means you can take as many practice swings as you like before taking your shot. You'll be given lay-up points providing distances, while the watch also tracks your distance covered, time on the course and calories burnt as you play. There's more information awaiting your arrival the the green, with a map showing the green layout and identifying hazards again, helping you decide how to best tackle the hole. Putting isn't included automatically, so you'll have to input the number manually. TomTom said that although others will automatically count up your putts, it's not a very reliable system and better left to manual input. Once all the information is in, your score card is updated leaving you to proceed to the next hole. The TomTom Golfer 2 syncs to your TomTom account thanks to the MySports system, so you'll be able to view the data on your smartphone, or get a more detailed view through your web browser. This will give you a complete breakdown of how you tackled each hole so you can get a better idea of each aspect of your game. The idea is to give you all the information you need to identify weaknesses and help you adapt or focus practise on weaker parts of your game. You'll also be able to compare that with strong performances on a particular course so you can see where you are perhaps going wrong, or could improve. 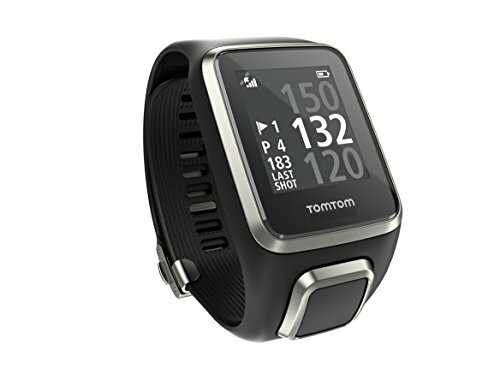 The TomTom Golfer 2 will be available in May for £199, which is the same price as the device it replaces. For that you have an updated design with a better strap and a slimmer and more sophisticated design. There are added features in the shot detection and plenty of information on courses around the world, as well as how you play them. The design is familiar to us from our time spent with the TomTom Spark, built around the same module, and we can't wait to get the TomTom Golfer 2 out on the course to test its capabilities in the real world.